Question: Do you have people sit for your or do you paint from photos? And is the clothing original on your portraits or from your imagination? All of the above! I work from photos that I have taken. My goal is NOT to paint a portrait of my model but to use the face, the lighting, the expression as a starting point. I exaggerate features and combine different faces. What I'm painting is an expession or feeling not a specific person. The same with the clothing. I have hundreds of books on the American Indian so I do research to find the clothing I want or I attend Pow Wows and take photos. I usually don't reproduce any of them exactly as I find them. yes the above picture is looking great. Where do you find your models? 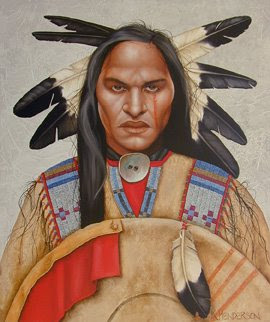 The paintings are incredible...especially to see your Native American series all together in your video! Great work! Suzy, the models are just people I know. Ms. Henderson, I admire your artwork, which I usually see on the True West site, including your portraits of native Americans, as well as your still lifes, pictures of horses, etc. But there is one thing I am curious about. You tend to portray your Native American subjects with full lips. However, most photos and paintings I see of Native Americans show rather thin upper lips. I know that you say that your portraits are not exact depictions of your models (photos), and that you exaggerate certain features. But is there a particular reason for the full lips? Murray, I pick features that are pleasing to me and tend to be a bit on the "dramatic" side. The American Indians I portray tend to be from the 1800's - early 1900's. By that time many of their traditions were mingled with other tribes as well as other races. Many were also of mixed race and will have facial characteristics that show that.